My good friend Linda from Somewhere in Time gave this award, its great!!!! I think Linda and I have been bloggy friends since I first started blogging. Thanks so much Linda, I really appreciate it, love getting awards! 1. 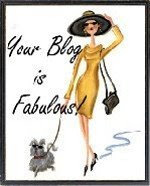 Pass it on to 5 fabulous blogs. 2. Include the person that gave it to you and link it back to them, if you can.